Kampala is the capital and largest city in Uganda with a population of about 1.4 million. It is located in the central south of the country at an elevation of about 1,200 metres and near Lake Victoria. Although African cities in general are not amongst the world's finest, Kampala is an attractive, lively and colourful city, with several ethnic groups to admire of which the Baganda are the largest with 60% of the total population. It is said to have been built on seven hills and every hill has its own features. There are good hotels and restaurants and most people visiting Uganda stay a day or two in Kampala at the beginning or end of their trip. Bahai House of Worship is considered the Mother Temple of Africa of the Baha'i Faith. 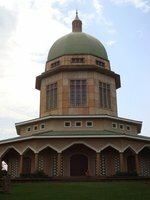 The temple is on the edges of Kampala located on Kikaya Hill. The building was designed by Charles Mason Remey who gave it the green dome that was constructed from mosaic tiles made in Italy. The lower tiles are from Belgium. and the colored glass in the wall panels came all the way from Germany. The temple grounds all include a great garden, house of worship and a guest house. Also known as the Amakula Kampala Cinema Caravan Festival, this festival moves around the country over a course of four months, from the beginning of September to the end of November. It showcases both old and new films that feature themes of independence and fall under one of five platforms, which include African Panorama, Highlights and Tributes, Regional Views, Landmarks and Contemporary World Cinema. It also offers workshops on film training and creating soundtracks for silent films. Each September, this popular three-day festival takes place at the Uganda National Theatre in Kampala’s city centre. The festival focuses on arts and culture in Uganda and is a must for all visitors hoping to learn more about the music and art scene of the country. This festival has grown to become the country’s number one festival, in which Kampala truly comes to life. The festival brings music, film, dance, theater, and visual arts together under one roof, and showcase not only local artists but those from other East African counties as well. This one-day event happens each October in Kampala and features some incredible jazz played by musicians from all over the world. Each year there is a new list of performers, but one thing that is consistent is that the music is always fantastic. Saxophones, bass guitars, drums, keyboards and pianos play to a growing audience of Ugandan jazz lovers, and of course visitors are always welcome. This annual festival is to showcase the diverse cultures throughout Uganda through art, music, poetry and dance, with an emphasis on female artists. Each December thousands come to Kampala’s Kyandondo Rugby Club to watch some phenomenal live performances. The festival also has a lounge area where festival goers can socialize, as well as booths that promote woman’s rights, education and HIV/AIDS awareness. Kampala has a hot and humid tropical climate, with temperatures usually around 30 °C or just below. The hottest month is February when temperatures occasionaly hit 35 °C. The cooler period is from May to August when temperatures can drop below 15 °C but it rarely get colder. March to May is the long rainy season, with April being the wettest month. A shorter and less wet period lasts from late October to early December. Entebbe International Airport (EBB) near the capital Kampala serves many international destinations including Nairobi, Mombasa, Khartoum, Kilimanjaro/Arusha, Dar es Salaam and Zanzibar with Air Uganda. Other airlines serving the country are mainly African airlines serving a number of destinations in East and Central Africa. South Africa Airways flies to Johannesburg, Brussels Airlines to Brussels, British Airways to London and KLM to Amsterdam. Eagle Air has many charter flights to lots of African countries only. Eagle Air probably has the most domestic flights, flying between Entebbe and most major towns. Several other smaller charter airlines have flights as well, including those to small airstrips in or near national parks. 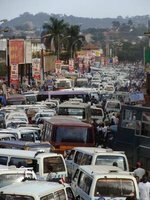 Kampala is connected to the rest of the country by relatively good tarred roads, although it is recommended to hire a 4wd and be only travel during the day. Many buses serve from Kampala to dozens of destinations in Uganda and beyond. There are regular buses to Nairobi and Kigali. Several agencies offer car rental, with or without driver. While self-driving in Kampala may not seem tempting, car rental is a great option to explore the rest of the country. Upon request, most businesses can get you safely out of Kampala before handing over the keys. The fastest and most dangerous method is the boda-boda: motorcycles that you see all over the city. You won't be in Kampala long before being propositioned by a boda driver. If you're not interested, a simple 'no' will get them to leave you alone. You can get most anywhere on the back of one for UGX3000-5000, but make sure to agree on the fare before the ride begins. Men usually ride facing forward while women are expected to ride side saddle; very risky. Females can get away with riding facing the front, but may be accused of riding "like a man," though the locals are fairly understanding of female tourists doing this. Boda-bodas are extremely dangerous as their riders will do whatever it takes to get you to your destination quickly. Expect to dart in front of and against traffic and even though crowds of pedestrians when necessary. Boda-boda accidents account for most of the hospital visits and traffic fatalities in Kampala; you have been warned! Matatus are a series of minibuses that follow relatively pre-set routes all over the city and many other parts of the country. Confusingly, they are known as taxis in Uganda. It might be a bit confusing in the beginning how to use the matatus to efficiently get where you want to go, but it's really not so difficult. Matatus will stand in the park until they are full, something that normally takes less than 15 minutes, but can take over half an hour (or even over one hour late at night or on Sundays). Matatus that leave the area around the park are hence full, which makes it difficult to hop on a matatu at other places in the city centre. Unless you're very lucky, you'll have to go to where the matatus start in order to leave the city centre. Recently the government has introduced larger City buses that run on fix routes. This mode of transport is still limited but some buses run along Jinja Road, which has some designated bus stops. all the city buses start at Constitutional square on Kampala road. the fare is Ugx 1000. one city bus goes to and from Constitutional square passed Acacia mall. and one bus goes to and from Constitutional square passed Lugogo Mall. There are a number of dining options in Kampala ranging from the cheap and local to the very fancy (and very expensive). Everywhere you go you'll see signs for little hole-in-the-wall restaurants (including some called "pork joints"). Most of these places don't have menus, so you'll have to ask what's available. Common options include meat (usually beef), rice, beans, Matoke (steamed green bananas, served mashed). Common dishes that can be found in most of the city restaurants and in the country side are Fish and Chips and chicken and chips. These meals vary in servings and will cost between UGX4500-9000. Be sure to ask the price ahead of time so that you don't get surprised later on. Prices are typically UGX500 per item, but can vary. Sodas and bottled water will cost more too. Matoke with groundnut sauce can be delicious! For a street snack, the famous "Rolex" is very enjoyable. It is made out of a chapati (kind of a pancake) wrapped around an omelet, with cabbage and tomatoes. Expect to pay UGX700-1000. Other street food includes roast chicken, goat and beef. This is usually served with chips or a salad or both. Pricing is per piece UGX2000-4500. If you are looking for something healthier but still want to enjoy the experience of roadside eating, the best bargain is with roasted corn or maize. The white maize is slow roasted on a charcoal grill and is available for UGX500-600 per cob. Freshness is guaranteed as Maize is a common plant found throughout Uganda. Usually the vendors will have a stall close to a source of maize plantation. Drink only bottled water - spring water brands like Rwenzori and Blue Wave can be trusted - or tap water that has been boiled/treated appropriately. If you feel like going out, go out, you should be safe, just exercise common sense. Ugandans are very sociable. Kampala's nightlife centers around the neighborhoods Bukoto and Kabalagala. Several clubs are also in the Industrial area (e.g. along 1st/6th Street) and along Kampala road plus Acacia Avenue. Popular clubs are Club Silk, Venom Club, Club Amnesia, Casablanca, Cayenne Restaurant and Lounge, the Mask Lounge Club and Ange Noir. Going out clubbing in Kampala can be very expensive. Internet cafes can be readily found in Kampala and Jinja. In most larger towns you'll find internet cafes running off of either VSATs or mobile phones. The Internet connection bandwidth is very low and can be frustrating for those who are used to a high speed internet connection. Mobile phone network coverage is available in most parts of the country (over 80%), but geography can cause trouble in the mountainous regions. SIM cards are cheaply available everywhere in 'starter packs' but need to be registered before use. They make a good deal though, as prices for international data roaming are extremely high. Mobile broadband (3G, HSDPA, HSPA, HSPA+) is available in several places. Airtel has mobile broadband available in larger places along Jinja Road. An example of price for mobile broadband on a phone through Airtel is UGX25,000 for 1GB traffic in one week.In the more rural areas, a slower (EDGE) connection might be available. Orange also offer mobile broadband. Other networks include MTN (the biggest in Uganda), Warid Telecom and Uganda Telecom. Posta Uganda offers reasonable services. Prices are not high, though it might not be the fastest company. Expect postcards and letters to take at least 7-10 days to Europe, longer to North America and Australia. Post offices are generally open from around 8:00-9:00am until late afternoon. If you want to send parcels overseas, it would be better to use companies like TNT, UPS, FedEx or DHL, as they are competitively priced and also much faster. We have a comprehensive list of accommodation in Kampala searchable right here on Travellerspoint. You can use our map to quickly compare budget, mid-range or top of the range accommodation in Kampala and areas nearby. This is version 19. Last edited at 3:17 on Aug 2, 17 by sleepBot. 17 articles link to this page.